Some rampaging soldiers in Lagos State on Friday set some buses of the Lagos State Bus Rapid Transit (BRT) System on fire after a soldier was allegedly killed by one of the buses in Palmgrove area. Eye-witness said that the incident happened when the BRT driver changed his lane and accidentally knocked down the soldier on a bike. Two eyewitnesses, who spoke to Channels Television, gave different accounts concerning the incident which occurred on Friday morning, leading to the damage of BRT buses, attack on civilians, journalists by soldiers. As a result of that, some soldiers gathered at the scene along Ikorodu Road, stopping all BRT buses and destroying some of them. Aside from the buses that were set ablaze, some persons were beaten-up mercilessly by the soldiers who set one of the buses on fire close to a petrol station. 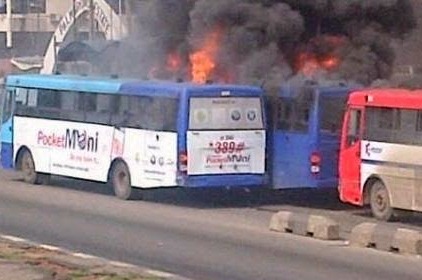 However, the Army has come forward to deny that soldiers set the buses ablaze, noting that “Area Boys” had taken advantage of the situation, after the BRT bus knocked down a soldier and attempted to drive away with his body. According to a statement by the Army, the BRT bus in question had been driven to a secure location.